The bluff in this photo is one of the most unique beach wedding photos I have taken on Cape Cod. The photo was taken at a private estate in West Yarmouth. The owners rent out their house for weddings and events and set up a tent in their yard. 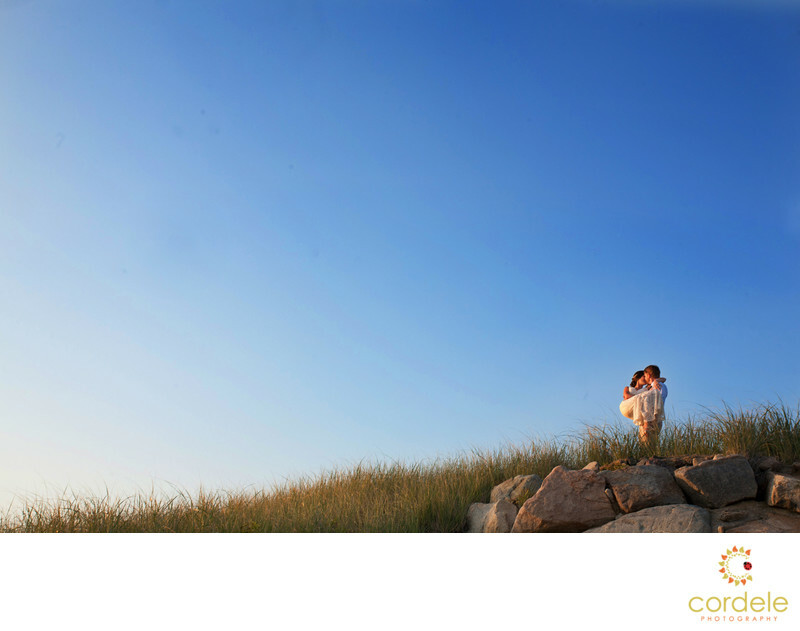 It's one of the most breathtaking spots on Cape Cod for a wedding. It has to be one of my favorites from 2014. I love this shot because of the blue sky and the negative space. Not many times am I able to be at this angle, and it's such a unique perspective. I love shooting weddings on Cape Cod because I grew up down on the Cape. My family had a house right next door to the Harwich Junior Theater on Division Street in Harwich. In about 2005 we moved over to West Dennis where I spent my college years life-guarding, and then my family finally moved again to a house on the Bass River in Yarmouth. Cape Cod has such a special place in my heart and I love shooting weddings down there because I understand it's charm like no one else. For this image I chose a really wide lens because I wanted to show off as much as the landscape as possible. The bride chose this beach house for her wedding because of this bluff. To not show it off would have been tragic. When should you book your photographer and other vendors? For Cape Cod Weddings clients should really try and book both the venue and the photographer about a year out. The nice thing about hiring me is that I already own property in Yarmouth so I have no travel fees. I also go down the Cape on Thursday night to avoid getting stuck on the wrong side of the bridge. I know one year my sister was driving down and there was a head on collision that shut the bridge. For a wedding photographer, that is a NIGHTMARE. I wouldn't head down EVER on the day of the wedding. This particular bride found me because I was friends with her sister from a local Moms game. Location: 19 Columbus Ave, West Yarmouth Massachusetts.